Last year on Memorial Day my sister, Jenn, my niece, Kira, and I visited Arlington National Cemetery. Truth be told, it was kind of whim--we were in town, and we took the hop-on-hop-off bus around D.C. that day. One of the stops just happened to be Arlington which, we had heard the night before on the news, had some pretty big Memorial Day events going on. So we thought we'd check it out. I'd say "pretty big" is an understatement. I don't think I'll ever forget roaming the grounds, astounded that someone had taken the time to put a small flag next to each and every headstone. Or seeing the loved ones who had traveled long distances to be there on that day. Or witnessing the Presidential motorcade driving right past us, taking then-president Bush to the ceremony. 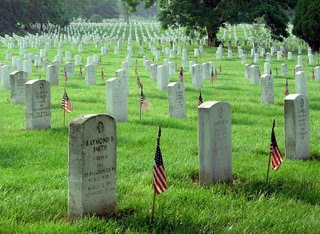 It truly is an amazing sight, and if you ever have the chance to experience Arlington on Memorial Day, you should. Yesterday in church, one of our pastors, who is himself a veteran, asked all the veterans in church that day to stand. They did, and the rest of us spontaneously broke out with clapping (believe me, if you know our church, you know what a big deal that is!). Again, an amazing experience to be able to personally honor, in some small way, those who have served our country well. Today, please take time to thank a veteran for the part they have played in providing the freedom that is so precious to us. And if you can't do that, then thank God for the country in which we live and for those who have died to protect us. Arlington is awesome any day of the year. Go to National Geographic on line and watch the programs on Arlington. Trust me, they are worth the time...very interesting and very moving. There is great attention to detail there. It will amaze you!